We know, there are so many pink lakes and so little time. Fortunately, there are plenty of these natural beauties all over the world. Surrounded by an incredible backdrop of the rolling Andes Mountain range and rocky shorelines, Laguna Colorada is a sight to behold. 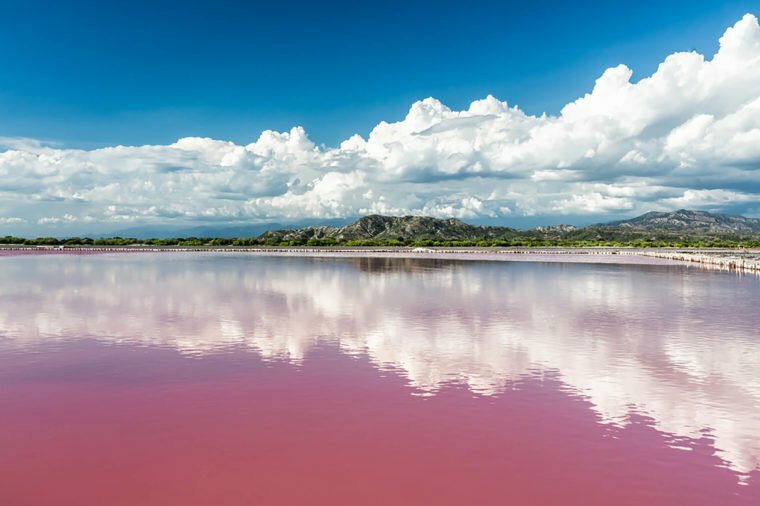 Practically skimming the Chilean border, this 23-square-mile beautiful pink lake has a maximum depth of nearly five feet. 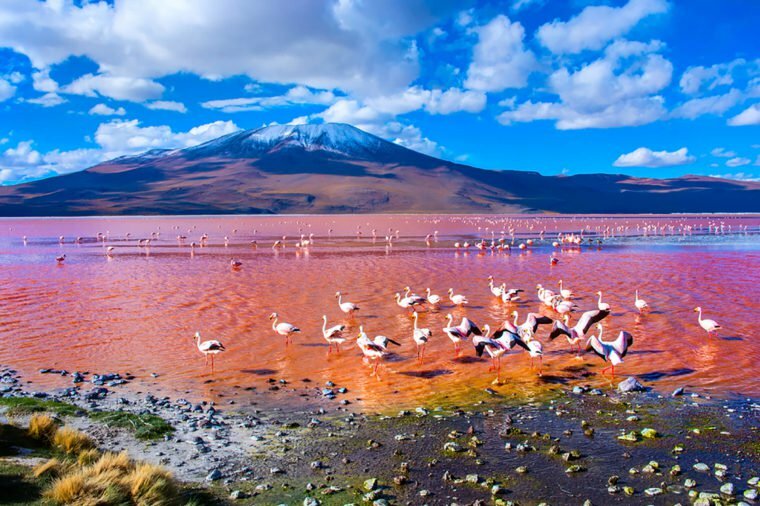 Its shallow waters make for the perfect hangout spot for Chilean, Andean, and the endangered James’ flamingos. The best part? It’s easily accessible and is surrounded by several small villages where travelers can stay overnight. Since its discovery in 1802, Lake Hillier has drawn in curious visitors from all over the world. Located on an island in Western Australia, this pink lake is 1,968 feet long and 820 feet wide. 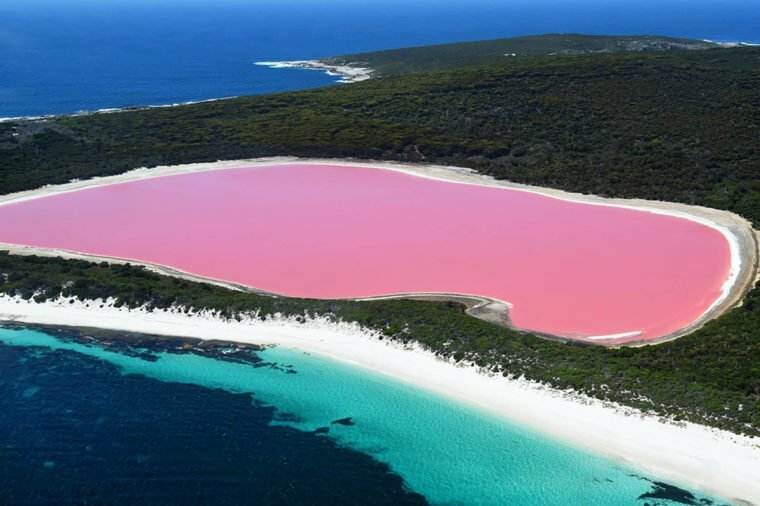 The lake’s pink hue is most vivid when viewed from above, and there are plenty of helicopter services available. The only downside:The helicopters can’t land there, but you can still take great photos. 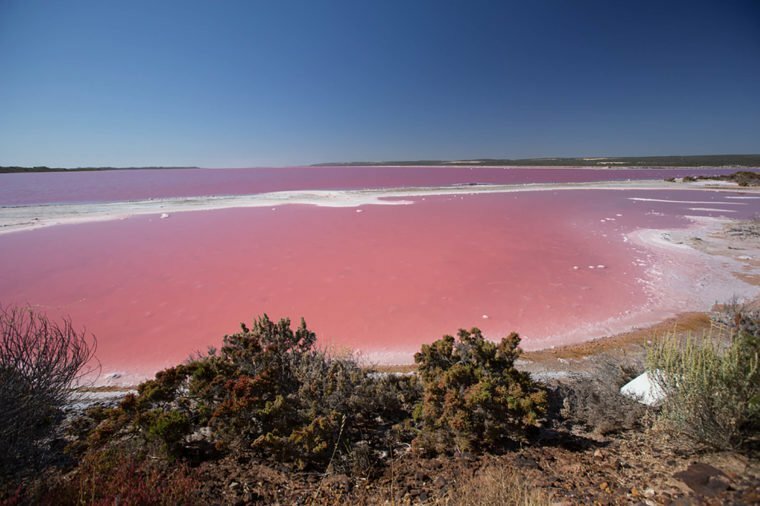 Another Western Australian lake that shares the same beautiful pink hue is Hutt Lagoon. Located in the fishing village of Port Gregory, this 27-square-mile lake actually changes color. While it’s predominantly pink, its colors transform to shades of red and purple depending on the time of day, season, and weather—although it’s said to be most beautiful when it’s mid-morning and at sunset. If you’ve ever wanted a free spa trip, consider it done. 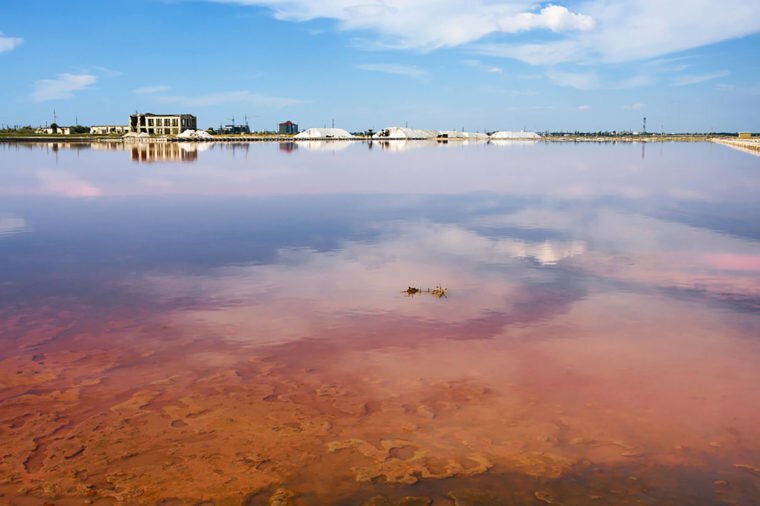 Las Salinas de Torrevieja in Valencia, Spain, is 3,459 acres of pure relaxation thanks to the salt in this beautiful pink lake. In the 13th century, a canal was built connecting the lake to the ocean to collect the ocean’s salt—and it certainly worked. In fact, there’s so much salt in Las Salinas de Torrevieja that there are mountains of it occupying its shore. While the lake might be an ideal place to pamper your skin and body, you probably won’t be alone. During breeding season, don’t be surprised to see thousands of flamingos and other aquatic birds. 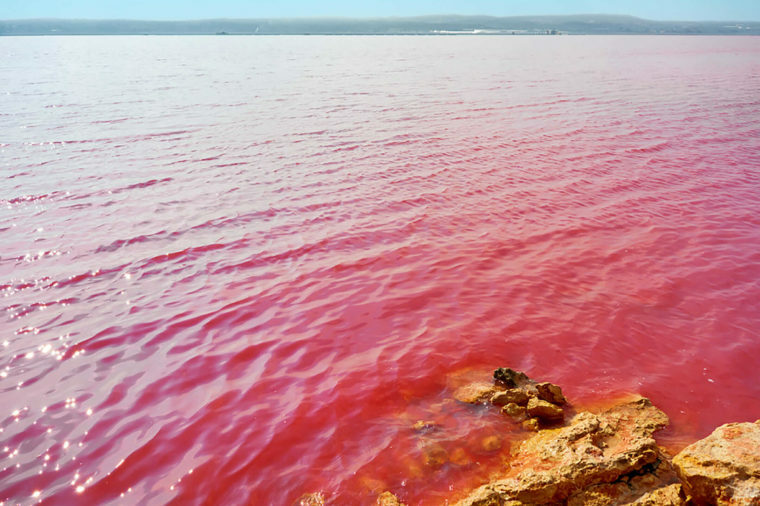 With salinity similar to that of the Dead Sea, it’s not surprising that Lake Retba in Senegal is a very popular site for both locals and tourists. 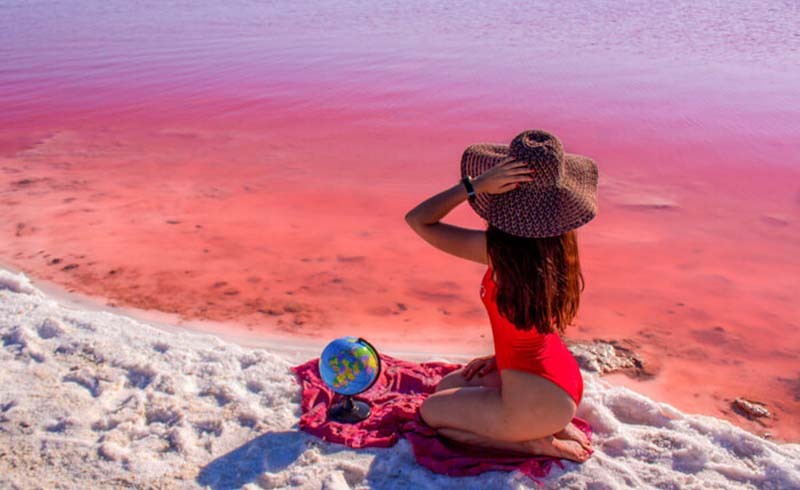 Not only is this 1-square-mile pink lake absolutely stunning, but it’s also used in salt production. It’s not unusual to see collectors scooping up salt from the bottom of the lake, and there’s an overwhelming amount of salt mountains surrounding the water. But if you’re visiting for the scenery, its pink hue is most vivid during its dry season between November and June. During this time, Lake Retba is even saltier than the Dead Sea. 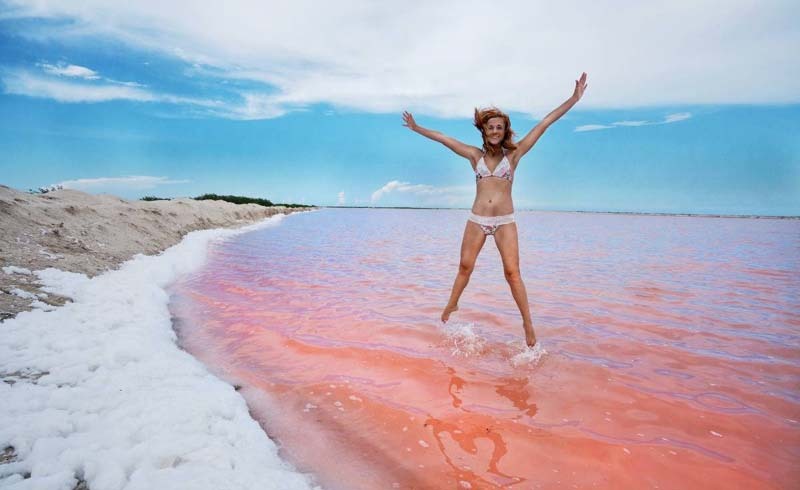 Situated in the Crimean Peninsula between the Black Sea and the Sea of Azov, the pink Sivash Salt Lagoons contain an impressive 220 million U.S. tons of salt. Regardless of how shallow their waters are (about 0.2 to 0.4 inches), the lagoons remain an essential part of the Crimean Peninsula’s economy as its salt is harvested and traded internationally. 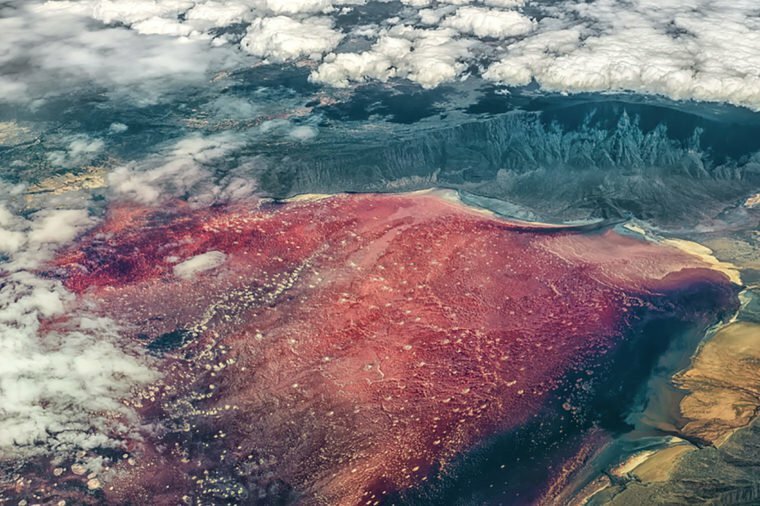 Located in northern Tanzania and bordering Kenya, you can find Lake Natron sitting below an active volcano in the Rift Valley. Despite its hot temperatures (as high as 140 degrees Fahrenheit), the gorgeous pink lake remains home to millions of Lesser flamingos. But since the alkaline water has a pH as high as 10.5, the lake is uninhabitable and “so caustic it can burn the skin and eyes of animals that aren’t adapted to it,” according to Live Science.